Title: 'Paris et Ses Monuments'. A birds-eye view of Paris, colour lithographed. 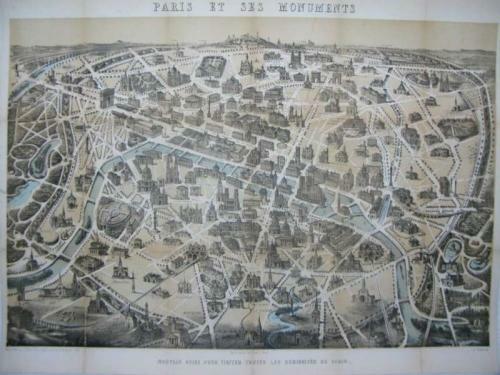 A fascinating, well-preserved mid-to-late 19th century map and plan of the city of Paris, with buildings depicted in birds-eye view perspective. Includes detailed representations of numerous monuments throughout the city, including the Arc de Triomphe, Notre Dame, the Louvre, and many, many more. Map is in very good, mostly clean condition. Some clean splitting along fold lines has been reinforced, some very light scattered foxing, of little consequence and hardly noticable. Otherwise the map remains, overall, clean, sound, well-preserved and still very attractive. Backed onto linen.